Blue Monday, as Mondays in January have become known, are regarded as particularly depressing mid-winter days due to a variety of reputed factors like weather conditions, level of debt, failed resolutions and post-holiday dreariness. Calculated from untested (and largely unscientific) formulas, and more recently from tweets, Blue Monday is nonetheless increasingly considered a by-product of cultural and societal stress and frustration. Although not observed as scientific in nature, this “Blue Monday” analysis of the human condition isn’t new. Indeed, perhaps because of the human condition itself, people have continuously sought understanding of what makes the human mind and emotions function. And so this brings us to The anatomy of melancholy: What it is, with all the kinds causes, symptomes, prognostickes, & severall cures of it. : In three partitions, with their severall sections, members & subsections, philosophically, medicinally, historically, opened & cut up. 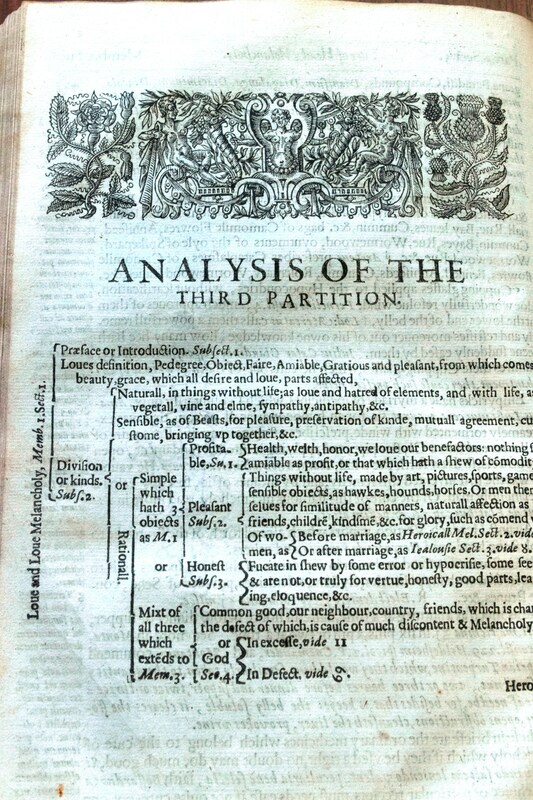 Written under the pseudonym “Democritus Junior”, author Robert Burton published the book in 1632, making it CHP’s oldest English language book. 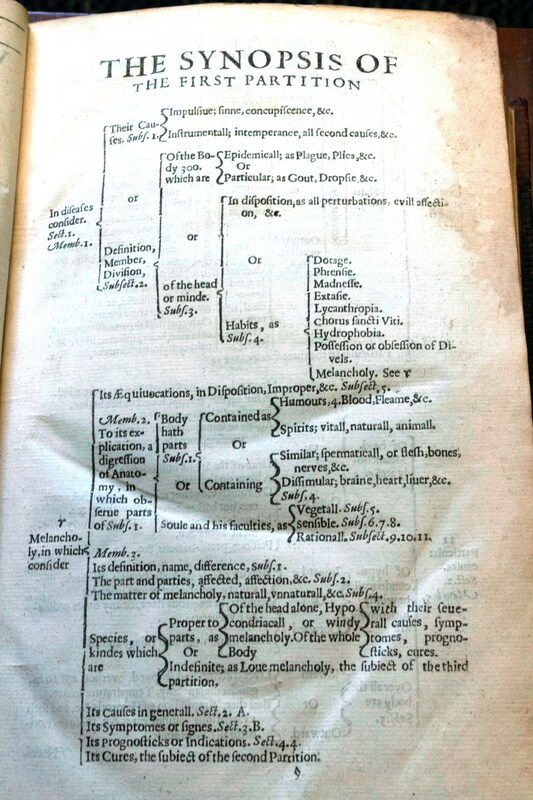 No formulas were used in determining what brings on “melancholia” and the closest thing to a tweet in 1632 is the book’s abundant marginalia. At just over 720 pages, Anatomy of Melancholy is generally considered a prosaic satire on the topic of depression, particularly that of the author’s own struggle with depression. It attempts to uncover the physical, mental and spiritual reasons for “melancholy” (depression or melancholic depression), rending it into three “partitions” within the text – 1. Causes, 2. Cure, 3. Love Melancholy. Common thought was that melancholy was responsible for the extreme emotions associated with love, religion, and mental illness. Often referencing religion as it explains the roles of devils and spirits in developing melancholy in human beings, it is unclear if these explanations are also satirical in nature or simply a sincere interpretation of the belief system in place at that period of time. Indeed, there is no scientific substantiation to complement Burton’s postulations in any of the book’s three partitions. These two characteristics, however, are precisely why Melancholy is so arresting. Given the book’s reputation as being a satire, and considering Burton’s prose-induced writing style, it is difficult to dismiss entirely the argument that the book was meant to be both a therapeutic outlet for Burton and a witticism for the reader. And yet it is equally problematic not to consider that “science” of the 17th century was based on mysticism, religion, magic and alchemy. 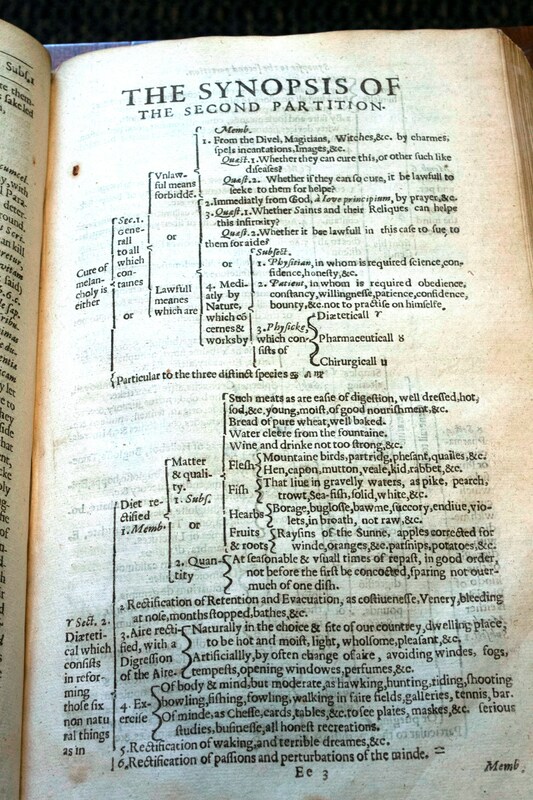 In the course of the 382 years since Burton’s book was published, we certainly consider ourselves a more enlightened society, more logical, more objective in nature. And yet, Blue Monday theories abound about why western society is sad, shrouded in pseudo-scientific formulas and research of Twitter accounts in an attempt to answer the same question Burton wondered. And although there is plenty of science behind what we now understand as depression, what generally entertains us is witty commentary about the human condition. 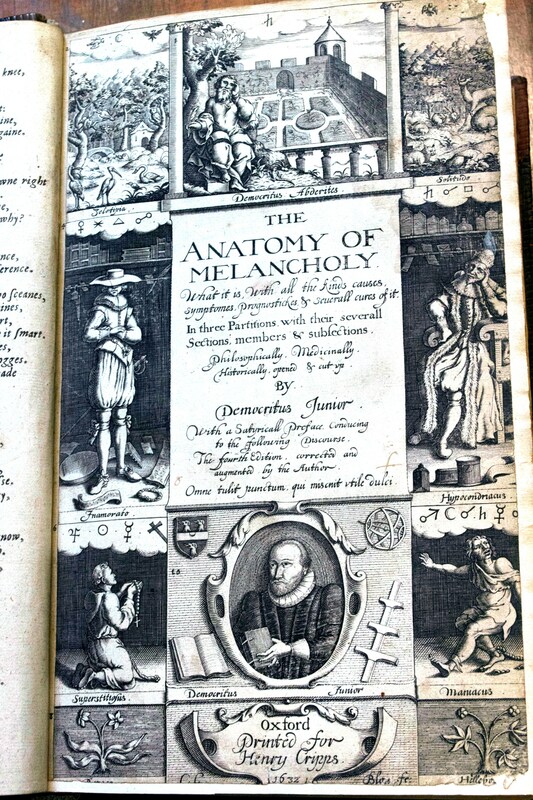 The Anatomy of Melancholy has been digitized and can be viewed and read using this link: http://cdm15960.contentdm.oclc.org/cdm/ref/collection/p15960coll25/id/6979. Seth Huffman completed a practicum with CHP in Fall 2013, earning his MLIS from Kent State University School of Library and Information Science. He worked with the CHP film collection creating metadata, rehousing and cleaning, and testing for acetate decay. Early in his work, he became especially interested in the films of Dr. L. Joseph Stone. Dr. L. Joseph Stone was a child psychologist who worked for Vassar College in Poughkeepsie, New York. Before starting his work with the Department of Child Study at Vassar in 1939, Stone worked for the Sarah Lawrence College. In the early part 1940 the department at Vassar College was given grants from the Josiah Macy Jr. Foundation and the General Education Board. Stone used the money from these grants to build a sound studio and an editing room. These would become the foundation of the Vassar Film Program. It was his dream to produce films on child behavior in order to teach others how to properly raise them and oversee their care. In the late 1940s Josef Bohmer became the technical director of the Vassar Film Program and he and Stone worked closely for over twenty years. 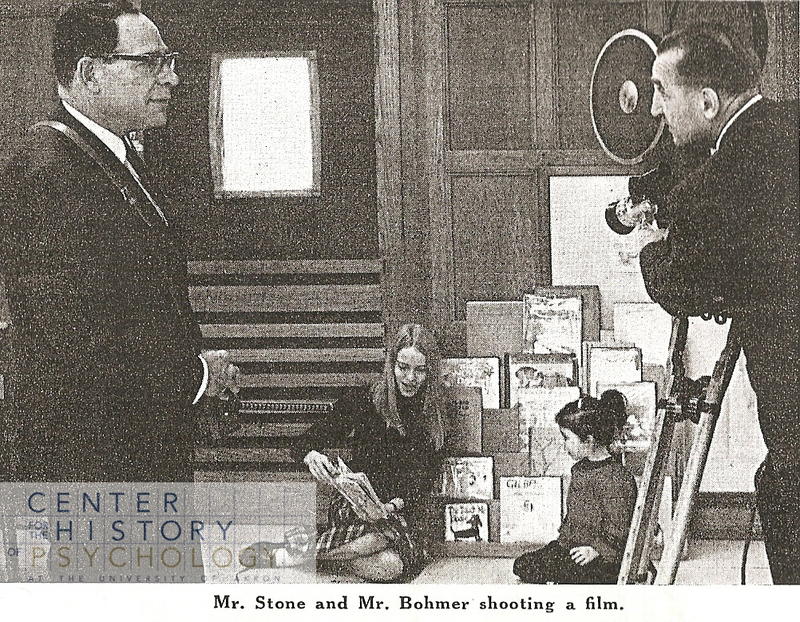 During his time with Vassar, Stone completed a twenty-three film series entitled Studies of Normal Personality Development. This series consist of seventeen films funded through the University and six that were funded through The Office of Economic Opportunity – Head Start Training films. 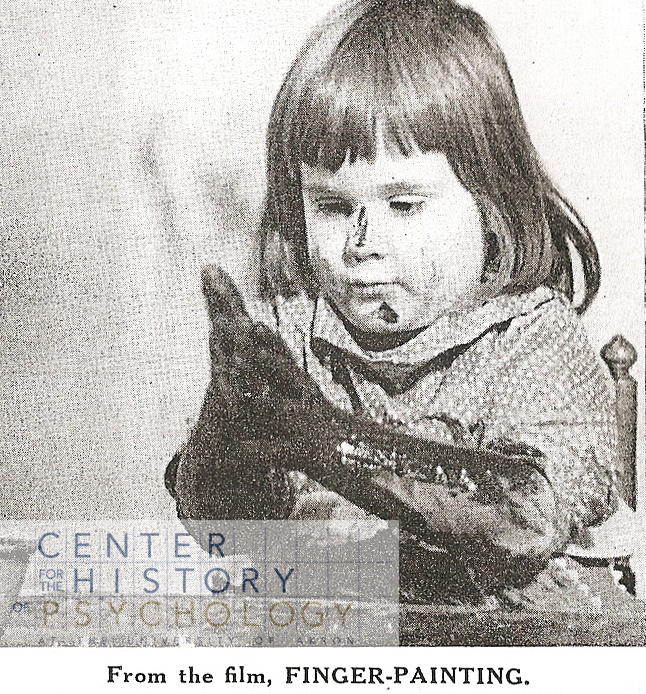 The series started in 1941 with the film Finger Painting and ended in 1967 with three Head Start Films, Organizing Free Play, Head Start to Confidence, and Discipline and Self-Control. Most of these films focused on children between the ages of two and eight and their raising. In 1965 the filming of infants and their development in institutions was added to the film program. This footage was filmed with the intention of creating another series focusing on infant development. While all films in this series are notable, there are some which standout as true treasures. One film which shows the true time and effort that was needed for these films is entitled: This is Robert. In preparation for this film, Stone filmed a child who was deemed “difficult” for five years. Starting when Robert was two years old until the time he was seven, Robert was filmed with the hopes of capturing the developing personality. Three other films that should be mentioned are: When Should Grownups Help and When Should Grownups Stop Fights from 1951, 1952 respectively. These films along with And Then Ice Cream, 1950, made up a sub-series entitled: Preschool Incidences. In these films a clip is shown of a child in a situation and the viewer is asked to decide what action to take. For example in the film When Should Grownups Help, a little girl is seen with a rope caught around her ankle and in the spokes of her tricycle. The audience is then asked if they would help the little girl and to what extent. 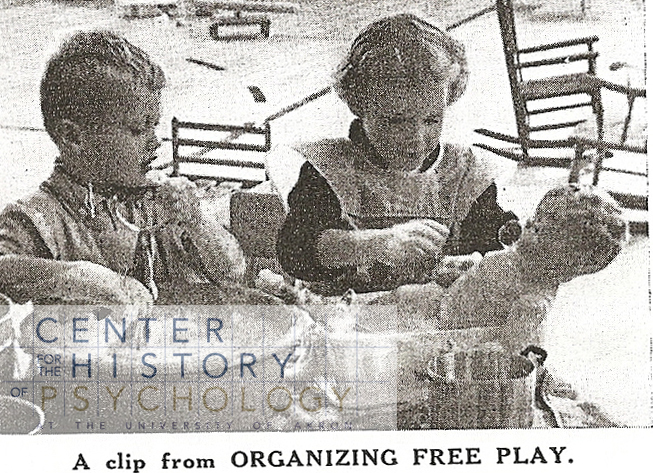 One of the last films created was Organizing Free Play. This film shows scenes from around twelve Head Start and other preschools centers and the many activities that the children can choose to participate in. These activities and the choices that the children make all are part of the “curriculum of discovery. The films in this series are fascinating for many reasons. 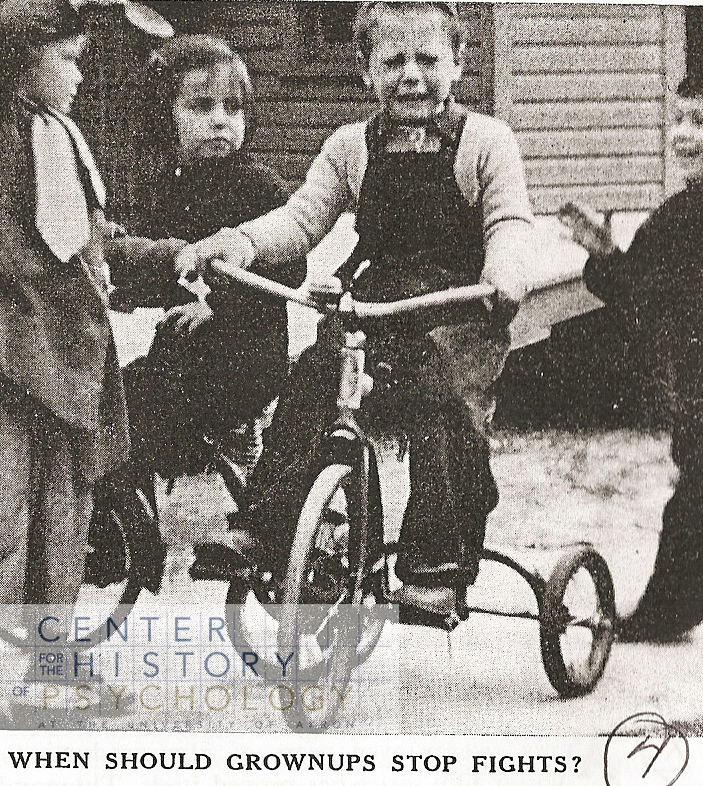 They provide a great window into past views on children and their development. Each film is remarkable not only for the content shown, but for the time and care that Dr. Stone invested each one. This series covers a period of over twenty-five years and throughout that time the amount of work that was done by Dr. Stone help lay the groundwork for future studies into child development.